The Needed Choice. The Better Choice. Life is busy. I’m sure that statement rings true in your life as well. For various reasons, life is especially busy for Jack and me right now. The other day in my quiet time, I was reading Luke 10. In that chapter is a story of 2 sisters- Mary and Martha (Luke 10:38-42). To sum things up, Jesus and His disciples were traveling, and Mary and Martha opened up their home to them. 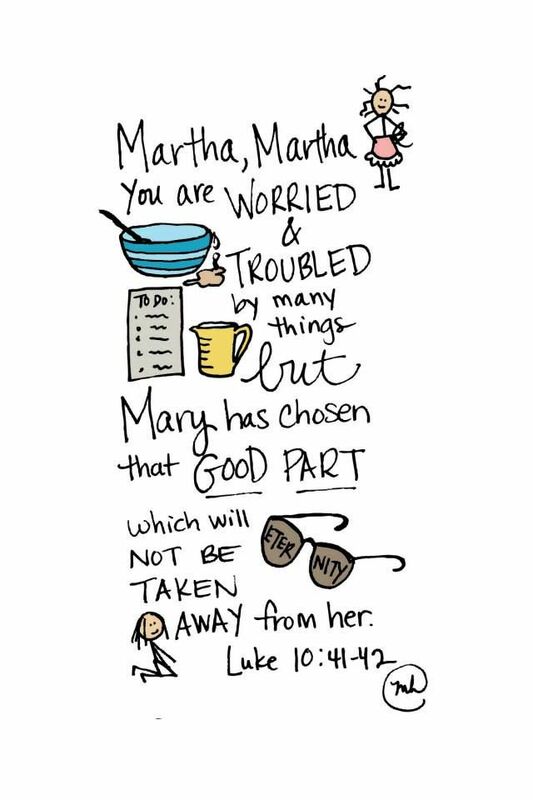 Martha was busy making preparations for the visitors, but Mary sat at the Lord’s feet and listened to what He said. Martha responded like many of us would; she wanted to know why she was doing all of the work and even asked Jesus to get Mary to help her. What exactly is the “better” that Mary chose? Mary chose to sit at Jesus’s feet and listen to Him. Mary put away the distractions of life and enjoyed being in the presence of her Savior. So, what do Mary and Martha have to do with us? I will be the first to admit that I am guilty of being distracted by the business of life, just like Martha. There is nothing wrong with being involved in things and having activities, but there are a few things that we need to understand about this. First, things in life can be (and are) good. Jobs are good, friends are good, playing sports is good, etc. There’s nothing wrong with these things. In fact, we should do many of these things I listed. The problem is when we continually choose what is good above what is better, and that better is spending time with Jesus. When the good things distract you from Jesus (the better), then those good things become an idol. Second, the distractions of life are fun (sometimes), but are they needed? No. We can clearly see that in Jesus’s answer to Martha. Jesus tells us that the only thing that is needed is to be with Him. Choosing to be with Jesus is the only thing we need. The rest of things in life are just added bonuses that Jesus gives us to use for His glory. Friends, I urge you to not get so distracted by the business of life that you neglect to choose the better thing for you and the only thing that you truly need- being in the presence of Jesus. I urge you to sit at His feet and listen to Him. Allow the Holy Spirit to speak into your life. You will not regret it. As you go throughout your day tomorrow, don’t get distracted with the business of life. Only one thing is needed of you tomorrow, and that is you listening at the feet of Jesus. This is the better choice. Let’s all be Marys tomorrow, friends!